If you suffer from aches and pains in your feet, ankles, shins, calves knees, hips, and back as a result of your passion for running, take this tip from Stanford University’s Cross Country coach Vin Lananna: wear thin-soled shoes or none at all. In a previous post, I talked about how to go about buying shoes, and I mentioned that your shoes should let your feet and ankles actually move the way they’re designed. Most running shoes these days don’t let your feet and ankles move properly! In fact, they make you run in an anatomically dysfunctional way, but you and I hear about it as the perfect “heel-toe” stride. Look at your foot. Notice how flexible your toes are? Your forefoot is comprised of many small bones held in place by dynamic tensions in the muscular and connective tissues. The forefoot can squish and adapt to impact, surface irregularity, etc. and can relax and contract as necessary. 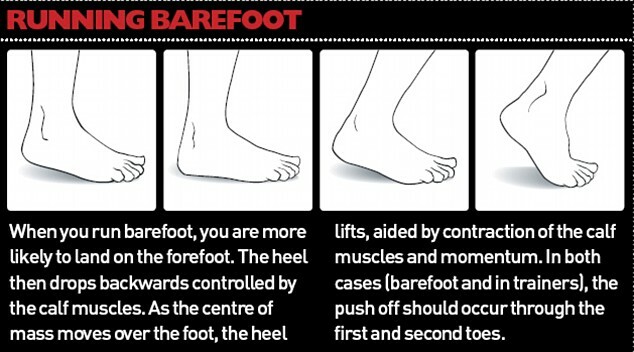 Compare the flexibility of your forefoot to that of your heel. 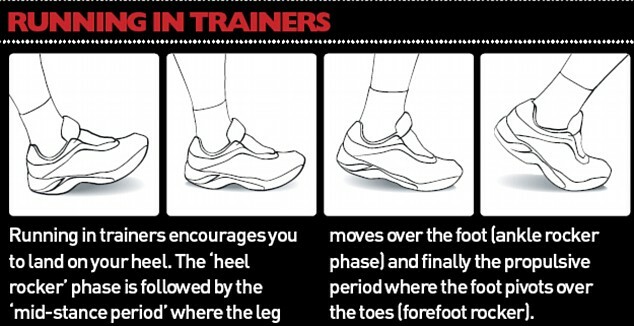 Can you wiggle your heel on command? Didn’t think so. It’s a bone. No flexibility. No ability to really absorb and dissipate impact! When you run heel-toe, your heel bone transmits impact directly into your shin bone, up into your knee, and further on up the chain. When you run with a natural stride as you would barefoot, you land on your toes, which allows your toes and your arches to absorb the impact so your legs, hips, and spine don’t have to. Running with a natural stride also allows your hip flexors to stretch out and gives you a little extra spring in your step that should propel you forward faster than you’re used to. Notice that sprinters are on their toes a lot? Think what that’ll do for you. Now, before you make the transition to thinner-soled shoes, be aware that there is an adjustment period. You likely won’t be able to cover the same distance you currently can with your thicker soles because your calves are not used to working the way they’re supposed to. Over time, though, your leg muscles will develop in a way that will make running feel easier and more efficient, so don’t fret. It’s a process, but it’s worth it.